Harris chaired the Council’s Housing, Health, Human Services and Education Committee and served on the Transportation and Utilities Committees. She sponsored or co-sponsored several gay-positive initiatives. She also helped to raise over $1 million to fight anti-gay ordinances in the state. Growing up in Newark with its poverty and lack of investment spurred her to promote downtown Seattle projects like the expansion of the Washington State Convention and Trade Center. In 1994, she and fellow Council Member, Jane Noland, successfully added an amendment to the Women and Minority Business Enterprise Ordinance to ensure a certain percentage of city contracts for women and minorities along with encouraging the city’s utilization of their businesses. 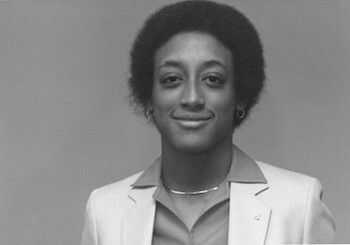 She co-founded and chaired the Gay/Lesbian/Bisexual Caucus National League of Cities. Sherry Harris lost her re-election bid in 1995. She attempted a political comeback two years later but did not win the general election. Since then Harris has focused on a holistic vision of persons, politics, and society. In 2010 Harris published her book, Changing the World from the Inside Out: Politics for the New Millennium. She founded her own company in Seattle: Spirit Mind Body Educational Resources. She lectures and conducts workshops locally, nationally, and internationally. Eric Marcus, Out in All Directions: A Treasury of Gay and Lesbian America (New York: Warner Books, Inc., 1995); Camille McCausland, The Spectator 62:8 (November 14, 1991); George Howland, Jr., “Power Lesbians in the Emerald City,” Seattle Weekly News (July 11, 2011), http://www.seattleweekly.com/2001-07-11/news/power-lesbians/.